The Challenge EH-3C Hydraulic Paper Drill can drill one, two, or three holes at time! This paper drill is designed to meet all your job requirements with its flexible back gauge adjustments, automatic drill return, and fast and easy head adjustments. The center head remains stationary, while outside heads are adjustable for easy hole-to-hold spacing. For three-hole drilling, all the user has to do is set the drill bits and guides to meet specifications. For two-hole drilling, simply remove one drill bit and reposition the drill heads and slide the guide to where it is needed. This hydraulic operation minimizes operator fatigue and results in consistent, clean holes and has a capacity 2-1/2″/ 6.4 cm. With just a simple touch of the foot petal the drill heads go down to the table, and at the bottom of the drilling stroke, drill heads automatically return to the up position. If the pedal is released at any time during the stroke, the heads immediately return to the upper position to minimize waste. The Challenge EH-3C Paper Drill includes three 2-1/2″/ 6.4 cm capacity 1/4″ hollow drill bits, three 2-1/2″/ 6.4 cm capacity 5/16″ hollow drill bits, twelve drilling blocks, hydraulic foot petal, hollow drill hand sharpener/chip removal tool, and a tool kit. 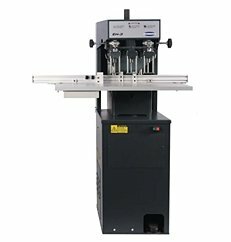 If you have any questions or are interested in purchasing the Challenge EH-3C Hydraulic Paper Drill, visit us at SpiralBinding.com. We have great pricing on a full line of Floor Standing Drills. Call us at 1-800-631-3572 for more information!